Whatsapp is the world’s most popular messenger or cross platform messaging app for mobile phones which is used to send free messages, Photos, Audios and Videos through internet. It is the highly downloadable app on mobile phones as compare to other apps. As we all know through the last 2 years WhatsApp has become the most famous messaging app for Android or other smartphones and also acquired by the giant social networking site Facebook. So recently WhatsApp developers add new feature called “Check Mark” or “Seen Ticks” which will appear when you send every message to your recipient. So many user don’t want to show these tick and so they want to hide whatsapp last seen blue ticks. In the same message read ticks are on Facebook. Which also creates serious issue so we already share method to hide last seen option from Facebook messages. In the same here is the method for whatsapp. How To Hide Whatsapp Last Seen Blue Ticks. If you are really not satisfied with this feature then don’t worry you can remove or disable this “Blue Ticks” or check marks. To remove this feature people not able to know that you read their message or not. May be some people know how to disable o remove these blue tick but those who don’t know don’t worry just follow below given steps to remove “read receipt”. Step 2:- After Downloading new version >> Click on your WhatsApp account settings. Step 3:- Settings>> Then click on Account>> Privacy. Step 4:- Scroll down and you will find “Read Receipt” feature option. It will show you Tick on it Simply just Uncheck the tick option. Note:- Users who already have new version of WhatsApp they can simply follow the above steps and remove read receipt but people who cannot not find Read Receipt option in privacy setting need to update their WhatsApp. It must be noted that if you follow this method, you will also not be able to see read receipts on the messages you send to others. But if you just want to hide your receipts and still see others read receipts, follow the next method. If you just want to hide your receipts and still see others read receipts, follow the steps given below. Step 1:- Download WhatsApp+ (Plus). 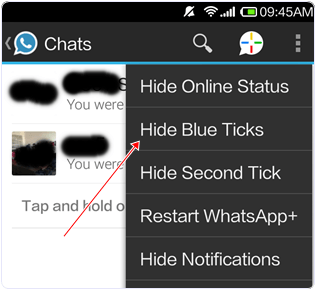 Step 2:- After Installing WhatsApp Plus go to your WhatsApp menu and and click on Hide blue Ticks. In conclusion, we hope you will remove read receipt feature with the help of above steps, but if you can find any problem regarding these steps then feel free to ask.